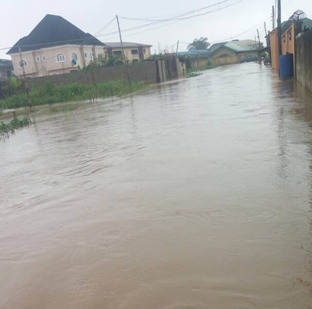 Parts of Makurdi town, Benue State capital have come under flood water with over 90 houses and business outlets submerged at the Nyongu community, Rice Mill area of the town. The rising water level of River Benue has left several households displaced leaving most of them with the option of taking refuge in homes of relatives residing in upland parts of the town. A victim said the surge, which started about three weeks ago, took the local residents unaware and unprepared for the deluge which had taken over the entire community. According to one of the victims, John Onjefu, a commercial motorcycle operator, he left his residence two days ago for his routine business only to receive a call from a neighbour that his house had been taken over by the raging flood. “I rushed back home only to discover that all my property was under water but with the help of neighbours I was able to recover my bed and mattress and any other thing I could rescue”, he narrated. “Since then I have been living with an in-law who offered me accommodation but I am still in shock just like other victims. Meanwhile, the Benue State Emergency Management Agency, SEMA, has declared the state a flood risk zone following days of steady rise in the water level of River Benue. Executive Secretary of SEMA, Mr. Emmanuel Shior, who spoke after an emergency meeting between the National Emergency Management Agency, NEMA, Benue SEMA and stakeholders on emergency matters in Makurdi, said efforts were on to mitigate the effects of the looming disaster. Shior said that as of last Tuesday, the level of River Benue water had increased and risen by 11 percent which had already put the state at risk of an impending flood. He appealed to those residing at the river bank and flood plains to immediately evacuate to avoid the trouble being witnessed in some parts of the country and a repeat of the 2012 and 2017 flood disasters in the state. The Executive Secretary explained that, as part of the pre-emptive measures to avert any form of disaster in Benue, the state government had put in place modalities to appropriately respond in the case of any eventuality. “Reports from officials of Cameroon indicated that the water in Lagdo dam is yet to be released but they may release the dam depending on the level of water there to avoid risking its facilities”, Shior said. “Though the water at the dam has not been released, the level of water in River Benue is indicative of an impending flood and there is urgent need for speedy action on our part. “Already we have taken all precautionary measures including aggressive sensitization campaigners across the state to enlighten our people on the possibilities of the flood given the daily increase in the water level of River Benue. Shior said the agency had already made arrangement to provide accommodation and support for helpless victims in the event of any disasters, assuring that all stakeholders had already been placed on red alert to ensure that the state was not taken unawares by the looming flood. Speaking on the Benue situation, the NEMA Zonal Coordinator, Mr. Selko Luguard, said his organization visited the state to assess the level of preparedness of the state government and stakeholders in the event of flooding. While urging the state to intensify efforts at mitigating disaster, Luguard said NEMA had commenced training of officials of SEMA and stakeholders on ways of handling any flood situation. Luguard disclosed that NEMA was also liaising with SEMA and other stakeholders in the state to response appropriately to the impending flood disaster whenever it occurs.